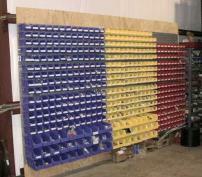 An empty wall in one area of the warehouse was fitted with plywood to allow attachment of steel louvered panels that would accept the existing hardware bins that Nooney was using for the many fasteners and fittings required in the assembly of their custom valves. New bins were added so that all hardware items are now stored in one convenient and easy to access location. 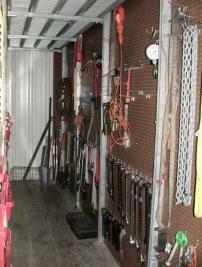 The side wall under the mezzanine was fitted with pegboard to allow for storage of specialty tools and lifting devices.